Hot off the presses: Doing Deals in Brazil, the 2015 PwC guide to investors. PwC has just issued the latest version of this very important publication, "Doing Deals in Brazil". This long-awaited pocket guide provides rich information about Brazil, challenges, opportunities, economy and M&A outlook, as well as an overall review of the macro framework for investors (accounting, tax, legal, labor, environmental, anti-corruption/clean company act). The guide can be downloaded here. We are proud to inform Tampa International Airport, one of our Patron members, has been awarded second World's Best in a recent survey by New York-based Travel + Leisure. Azul Linhas Aéreas Brasileiras S.A. has finalized a firm order for 30 Embraer 195-E2 jets and has secured purchase rights on 20 more. Embraer first announced Azul Linhas Aéreas Brasileiras’ commitment to the E-Jets E2 family as a letter of intent (LOI) during the Farnborough International Airshow 2014, in July last year. On May 21, 2015, Embraer announced that Azul Linhas Aéreas Brasileiras had signed a firm order for 30 Embraer 195-E2 jets and had acquired purchase rights on 20 more, firming an initial commitment announced at the Farnborough International Airshow 2014. 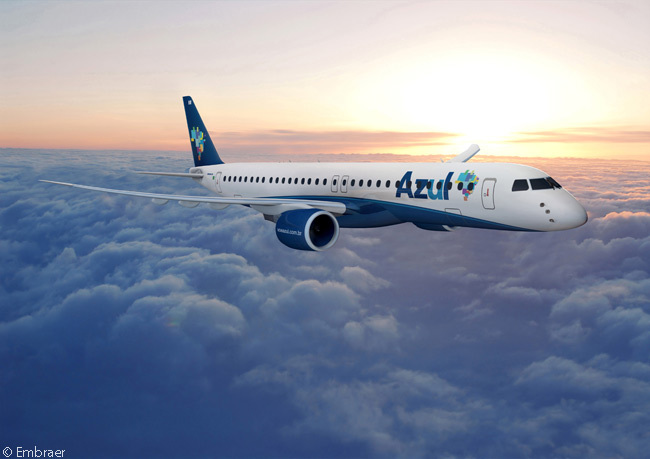 The Brazil-based manufacturer puts a total potential value of US$3.2 billion on Azul’s contract for up to 50 Embraer 195-E2 jets at current list prices, if the airline converts all 20 of its purchase rights into firm orders. Embraer will include Azul’s firm order will be included in its 2015 second-quarter order backlog. Azul is due to take delivery of its first Embraer 195-E2 in the second quarter of 2020. The Embraer 195 and Embraer 190, one of which is shown here, are the workhorses of Azul Linhas Aéreas Brasileiras’ domestic fleet, at least until the carrier begins taking delivery in 2017 of 63 Airbus A320neos it has ordered. 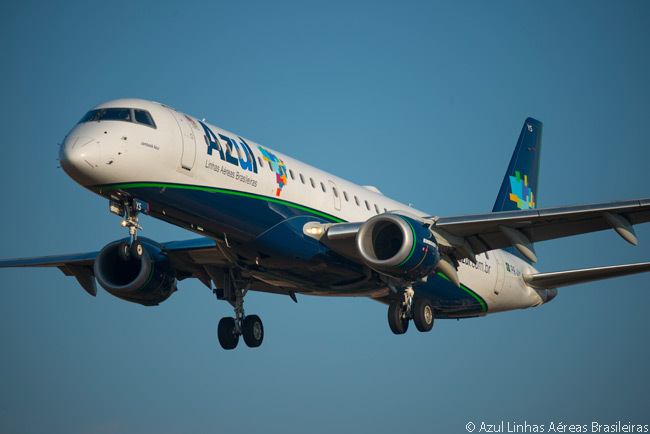 By May 2015, Azul had ordered or agreed to lease 73 Embraer 195s, 22 Embraer 190s and 30 Embraer 195-E2s. Currently, the Brazilian airline has 60 Embraer 195s and 22 Embraer 190s in service and has another six Embraer 195s on order. Azul operates the largest fleet of Embraer 195s in the world. With Azul’s May 21 firm order, the Embraer E-Jets E2-family firm-order backlog has increased to 242 aircraft, with Embraer also booking options and purchase rights on another 348. The first delivery of an aircraft in the E-Jets E2 family (an E190-E2) is planned for the first half of 2018. The Embraer 195-E2 is slated to enter service in 2019 and the Embraer 175-E2 in 2020. Embraer’s E-Jets E2 aircraft will all be powered by Pratt & Whitney PurePower PW1000G-family geared-turbofan engines. The PW1700G version will power the Embraer 175-E2, while the more powerful and larger-fan PW1900G will power the Embraer 190-E2 and Embraer 195-E2. TAMPA — Brazil is Florida’s No. 1 trade partner when it comes to exports. But getting in the door isn’t easy. Cutting through red tape and tariffs requires a sharp tool. So, when the Brazil-Florida Chamber of Commerce left Tampa and moved to Brevard County in 2012 to help bolster a faltering Space Coast, Bonaparte hatched a plan to fill that void. 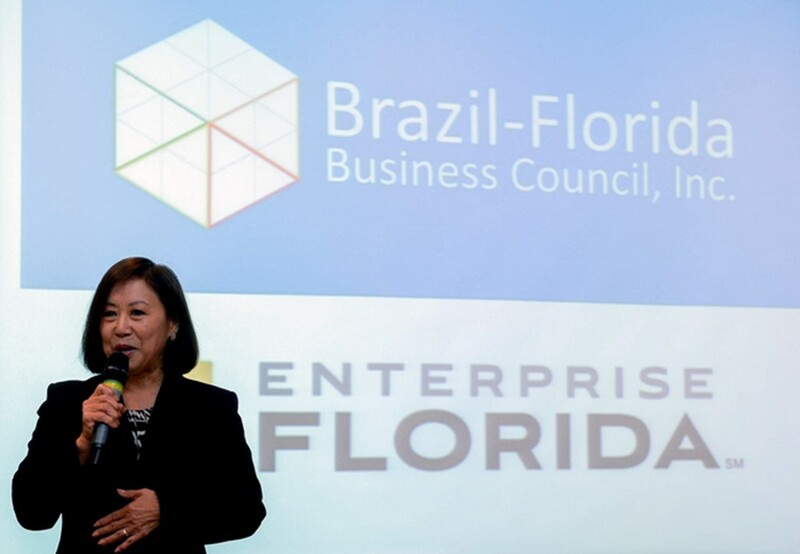 She officially launched the Brazil-Florida Business Council in March to provide a forum for business people to exchange ideas and network, and to facilitate and drive economic growth. In addition to driving new export opportunities, Bonaparte’s council is also helping Brazilians coming here to invest in American businesses and real estate. With Brazil’s economy slumping, a lot more Brazilians are looking to invest here, she said. Already, the council is attracting a multitude of interests, from attorneys to bankers, airlines, entrepreneurs and realtors in both countries. The council meets monthly for mixers to help members get to know each other and forge alliances in their efforts to grow business between this state and the South American country. “Brazil has always been one of our top trading partners,” said Eileen Rodriguez, regional director of the Florida Small Business Development Center, which is affiliated with the University of South Florida. “As a matter of fact, I’ve been teaching a class on introduction to international trade, and Brazil is always a part of that conversation. Brazil imports orange juice, coffee and aircraft parts into Florida. Making that connection can be trying, Rodriguez said, and business people need to be prepared for what they will face. “There are tariffs involved, there is red tape,” she said. “Those things affect everyone in the U.S. trying to do business with Brazil, but affect Florida even more because it is one of our top trade partners. “It can be a little cumbersome,” Rodriguez said, but pays off for businesses patient enough to wade through the process. Enterprise Florida, the principal economic development agency for the state and a public-private partnership between business and government leaders, keeps statistics on trade with various countries. It reports that in 2013, the Tampa metropolitan area accounted for nearly 11 percent of all exports from the state. In 2014, Florida companies exported nearly $5.1 billion in goods and services to Brazil. The top exports from Florida to Brazil were aircraft engines and parts, electric apparatus for telephony, electronic integrated circuits and automated data process machines. Bonaparte said her council is working with economic development agencies to help attract even more businesses here and to direct Brazilians on where to invest their money. “I’ve been very impressed by Sueli and the events she has had and the order she has brought to the process,” said Mike Meidel, Pinellas County economic development director. “The big thing she can do is connect people,” Meidel said. “We already have a lot of Brazilian investment in this area, and Brazilian tourists, and we have more opportunities to capitalize on that.” Bonaparte’s council will help make that happen, he said. Copa flies from Tampa International Airport to Panama City, Panama, where it connects to cities throughout South America, including Sao Paulo, Brazil. Sergio de Oliveira, who speaks Portuguese and is of Brazilian heritage, has transitioned from consumer electronics exporting to commercial lending and is anxious to see how the council can help him. “I’m hoping this will open doors for me, but also, to help them open doors here,” de Oliveira said. Polk State College, at its campuses in Lakeland and Winter Haven, is working on international initiatives and with the business community to expand opportunities through student training. Groups like the Brazil-Florida Business Council can enhance global studies at the school, said Naomi Boyer, associate vice president of strategic initiatives. “We’re working with the Central Florida Development Council right now on a trip to Panama for students,” Boyer said. The Brazil-Florida council gives the school “an active seat at the table,” to glean information it can share with students about how real world business works, she said. Rodrigo Souza, vice president of finance for Gerdau Long Steel North America, said the new council will give his company another inroad to customers in Brazil looking to buy steel products, then help them to set up financing for those purchases. Gerdau has about 500 employees in the Tampa area. May 1, 2015 - Tampa, Florida. 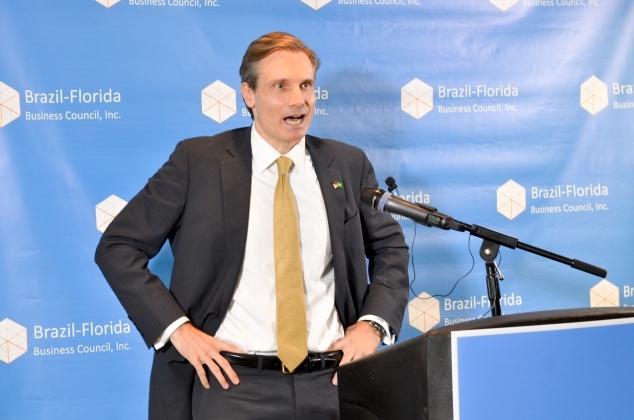 O Brazil-Florida Business Council (BFBC), criado com o objetivo de intensificar o relacionamento entre o estado americano e o Brasil através de intercâmbio de negócios, foi apresentada a empresários, executivos e investidores, durante evento realizado em São Paulo, no dia 23 de abril. Sediado em Tampa, Flórida, o BFBC foi idealizada pela paulistana Sueli Bonaparte, que dedicou mais de 25 anos de sua carreira profissional ao contínuo processo de estreitar os laços entre as comunidades empresariais do Brasil e dos EUA. Durante o evento, que teve início com café da manhã e networking, Sueli apresentou as iniciativas da organização. O encontro contou ainda com uma apresentação do representante do Governo da Flórida, Fabio Yamada, diretor da Enterprise Florida, agência público-privada que tem a finalidade de gerar emprego, renda e trabalho para o estado americano. De acordo com Sueli, "o Brasil estará navegando em águas turbulentas este ano, mas tenho absoluta confiança que vamos retomar o crescimento econômico como recuperamos em outras crises financeiras. E o BFBC vai desempenhar um papel significativo neste processo. Nós estaremos desenvolvendo um trabalho voltado para restaurar a confiança dos investidores estrangeiros e americanos, principalmente da Flórida. E ao mesmo tempo promovendo as oportunidades de negócios no Brasil e fomentando investimento americano do estado da Flórida para o País". A Flórida já é grande parceira de negócios do Brasil. Atualmente, o comércio bilateral soma 20 bilhões de dólares, com domínio absoluto do Brasil em todas as exportações, principalmente, de equipamentos eletrônicos e aviões civis, motores e peças. Fato que comprova a excelente relação comercial existente entre o estado americano e o Brasil. Com isso, a Flórida deixou de ser um imenso parque de diversões para se tornar o principal canal receptor de investimentos dos Estados Unidos. O estado investiu fortemente ao longo dos anos na reestruturação de toda a infraestrutura para receber novos negócios. Com avançado sistema de telecomunicações, projetos ambientais sustentáveis e estrutura fiscal favorável, o estado concentra grande pólo estudantil, ocupando a 5ª posição no ranking nacional de escolas estaduais, segundo a revista Education Week, além de contar com mais de 50 universidades públicas e privadas que trabalham em colaboração com a comunidade empresarial para a construção de programas que reflitam as necessidades industriais da Flórida. Devido à sua favorecida posição geográfica e proximidade com os mercados das Américas Central e do Sul, o estado está se consolidando como um dos principais pontos de acesso para aqueles que pretendem investir nos Estados Unidos. Com quinze portos de águas profundas, sendo o maior na costa leste, a região está preparada logisticamente para receber, armazenar e distribuir os produtos através das malhas ferroviárias e viárias que cortam o país, com distribuição estendida com agilidade para México e Canadá. E as vantagens para quem decide investir na Flórida não se restringem somente ao território americano. Segundo Fábio Yamada, diretor administrativo da agência Enterprise Florida, "quando o empreendedor abre um negócio na Flórida, automaticamente ele passar a fazer parte do tratado de livre comércio norte-americano e usufrui do benefício de fácil acesso ao Caribe, América Central, países do Pacífico e da América do Sul e futuramente com países europeus. E com praticamente tudo certo para o fechamento da aliança do Pacífico, as vantagens serão ainda maiores". TAMPA — In 2013, Brazilian aerospace company Embraer S.A. shipped a limited run of components for its Phenom 300 light business jet through Port Tampa Bay to be assembled in its Melbourne facility. It took a while, but that experiment has finally paid off for Tampa: Embraer is now sending monthly shipments of aircraft parts through the port. The company is sending parts for two kinds of planes now, according to port officials, and in 2016 plans to send components for two additional models. Embraer is one of the world's top business jet manufacturers. Last month it sent the first shipment of this new cargo line to Tampa from its headquarters in São José dos Campos, Brazil. "Brazil is a huge trading partner for Florida," Tampa Port Authority spokesman Edward Miyagishima said. "This is just a great service between Brazil and Tampa Bay." When Embraer sent the first shipments of its Phenom 300 to Tampa in 2013, each crate was nearly 50 feet long and weighed 8,500 to 10,000 pounds. Those massive crates were then trucked to Embraer's Melbourne facility about two hours and 20 minutes away. That was one of the reasons why the company chose Tampa: its proximity to Central Florida. Now Embraer has restarted that service and expanded it: The company has already started delivering segments of its Phenom 100E and Phenom 300 aircraft. In 2016, the company will start delivering segments of its new Legacy 450 and Legacy 500 aircraft. The plane components are being delivered by NYK RoRo of Tokyo, one of the world's largest auto shipping companies. RoRo is shorthand for "roll-on, roll-off," for the kind of ships that can quickly roll vehicles down a ramp and onto the docks. Last month's Embraer shipment to Tampa was the inaugural call for the new NYK RoRo shipping route, which also travels through ports in Brazil, Mexico, Aruba, Venezuela, Curacao and Argentina. 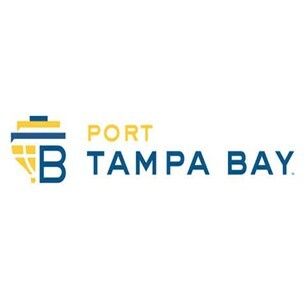 That's important to the Tampa Port Authority for another reason: It shows future customers that the port can handle other roll-on, roll-off cargoes such as Mexican-made cars and trucks. April 02. Tampa, Fla. Foi com muita simpatia, brincando que o Grêmio de Porto Alegre é seu time de futebol brasileiro favorito e se aventurando com algumas palavras em português que o prefeito de Tampa, Bob Buckhorn, deu abertura ao almoço inaugural do Brazil-Florida Business Council, no The Tampa Club, em Tampa, no dia 11 de Março. 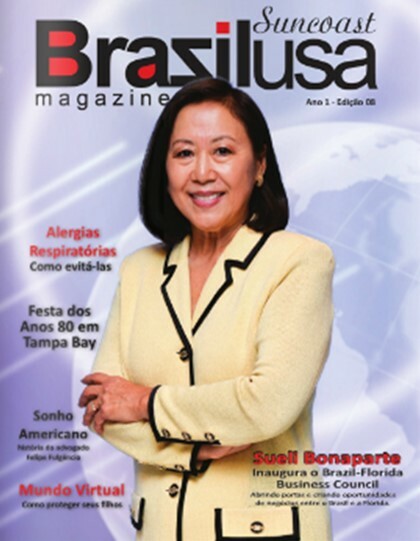 Fundado pela brasileira residente em Tampa, Sueli Bonaparte, o Brazil-Florida Business Council (BFBC) é uma organização sem fins lucrativos que tem por objetivo estreitar os laços comerciais entre empresas e/ou investidores brasileiros que buscam oportunidades na Flórida e americanos que buscam o mesmo no Brasil. Sob a liderança de Sueli Bonaparte e com a colaboração de um seleto grupo de diretores, conselheiros e parceiros, o BFBC já iniciou atividades com altíssimo nível profissional e de comprometimento com seus associados. Sueli tem dedicado mais de 25 anos de sua carreira profissional a forjar laços mais estreitos entre as comunidades de negócios americana e brasileira, sendo que destes, dezessete anos foram dedicados a Câmara de Comércio Brasil-Estados Unidos em Nova Iorque, como Diretora Executiva. To read the original article (in Portuguese), click here and navigate to page 24. March 31, 2015 – Tampa, Fla. How important is networking when it comes to finding opportunity? This was the question addressed by the most recent gathering of The Brazil-Florida Business Council (BFBC). High-level representatives from both the business community and public agencies came together to listen to Steve Knode's presentation on "Understanding the Brazilian Market: Overcoming Challenges and Seizing Opportunities" on Monday, March 30 at The Tampa Club. “It's important to work with partners such as the Brazil-Florida Business Council to help counsel and advise American companies about doing business in Brazil.” Said keynote speaker Stephen P. Knode, Deputy Senior Commercial Officer for the United States Commercial Service (USCS), the federal agency charged with promoting and protecting US business interests throughout Brazil, visited the BFBC gathering from his post in São Paulo. He discussed the positive attributes that attract business to the Brazil market as well as some of the common challenges for Florida businesses as well. Lorrie Belovich, Director of International Business Development for the Tampa Hillsborough Economic Development Corporation and a board member of the BFBC explained that part of her job is networking to promote trade investment. She not only works with Tampa Bay companies who want to export their products to Brazil, but also the Brazilian companies who want to establish operations in the Tampa Bay area. “We all can't do everything. There are so many layers of the onion in building international relationships. Having an organization like this, that can leverage and consolidate the efforts of what everyone is doing, with a focus on a single market like Brazil, is absolutely an incredible asset to our region,” Belovich said. Donald T. MacDonald, Founder and CEO of Consilium Global Research, a research firm based in St. Petersburg, shared why the BFBC is a vital source of information and connections necessary for his business. “Networking is extremely important. How do you meet people? The hardest part is knocking on doors,” he said. Luncheon keynote speaker Knode stressed that these monthly briefings help spotlight opportunities and provide a better understanding of Brazil to those in the Florida business community. March 17, 2015. Tampa, Fla. If you have ever heard Mayor Bob Buckhorn speak of his beloved Tampa Bay, you have undoubtedly heard him say “Tampa, this is our time” and Mr. Mayor, Tampa Bay couldn't agree with you more. Mayor Buckhorn has participated in many overseas trade missions, including Brazil in October 2013, where he signed a Sister City Agreement of Partnership with Porto Alegre, Brazil, and speaks at many international trade events throughout the Bay area. It is fitting that Mayor Buckhorn was invited to deliver the Welcome Address at the inaugural luncheon of the newly formed Brazil-Florida Business Council (BFBC) based in Tampa Bay last Wednesday (March 11). The inaugural luncheon was held at The Tampa Club with more than 100 in attendance. The event was sold out weeks in advance and brought together a diverse audience to celebrate this highly anticipated council. 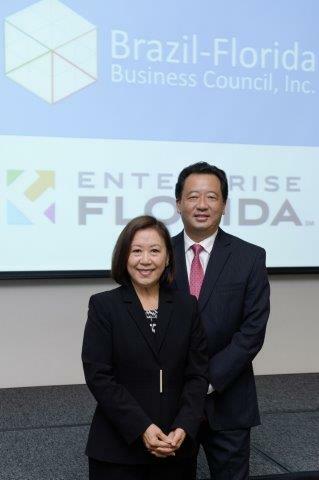 Representatives from the Florida SBDC at University of South Florida, attended the event along with representatives from the Tampa Bay Export Alliance, Enterprise Florida, U.S. Export Assistance Center and Port Tampa Bay. On March 30, the Brazil Business Briefing event will focus on Understanding the Brazilian market, featuring Stephen P. Knode, Deputy Senior Commercial Officer, US Commercial Service in Brazil, speaking on Overcoming Challenges and Seizing Business Opportunities. These are the types of events that I am excited about. They provide pertinent information that can help businesses enter the Brazilian market. Gabrielle Mandel, Country Manager, Brazil and Southern Cone, U.S. Trade and Development Agency (USTDA) delivered the keynote address and provided information on current projects in Brazil, which happens to be the largest portfolio in South America with more than 100 projects. Brazil is the only country in Latin America with a local USTDA representative, which utilizes a third of their budget. According to Mandel, aviation is the largest sector followed by surface transportation and water projects. There is currently a request for proposal for an engineering review of a new water treatment plant project in Rio de Janeiro, which closes on April 13. For details, click here. Mandel said, “Brazil is a dynamic portfolio for U.S. trade,” and encouraged companies to pitch project ideas to the USTDA for review and consideration of available grant funds for bringing the project to fruition. Bonaparte showed her dedication by establishing the BFBC and recruiting diverse and distinguished professionals for the Board of Directors and Advisory Board in just three months. Read the original article by Selma Canas here. March 13, 2015 - Tampa, Florida. 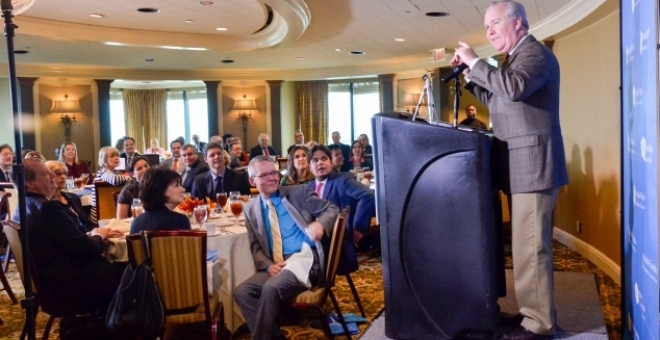 The Brazil-Florida Business Council, a statewide membership based council designed to drive bilateral business opportunities between Brazil and Florida, held its inaugural luncheon Wednesday, March 11, at the Tampa Club in downtown Tampa. Well over 100 attendees listened as Sueli Cristina Bonaparte, Founding President and Chairperson, stressed that the Council's mission is to strengthen business ties between Florida and Brazil and to extend economic opportunities for both regions. "Brazil has matured into a global powerhouse," Bonaparte said in her opening remarks. "Brazil is the seventh largest economy in the world, and Florida is the premier destination for Brazilian tourists, as well as intrepid Brazilian pioneers looking to settle here for business and investment opportunities." Sandy Murman, Chairman of the Hillsborough County Commission, also spoke of Tampa's close ties with Brazil during her introduction of Tampa Mayor Bob Buckhorn, who gave the welcoming address. Brazil, says Murman, is Florida's number one international partner, generating an import export value of close to $21 billion in 2014. Buckhorn addressed the crowd on the already close ties between Brazil and Tampa, and spoke about his administration's move forward to expand the city's presence in the world. 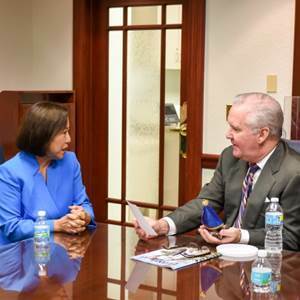 He explained why the focus of The Brazil-Florida Business Council is important to the economic growth of the city. "If we are going to be the city we want to be, that we are capable of being, we will have to expand our horizons, and be global in our perspective and global in our actions," Buckhorn explained. He went on to say he hoped his work with the Council would help "plant the flag of Tampa and the state of Florida all over the world." After lunch, Rick Homans, President and CEO of Tampa Hillsborough Economic Development Corp. and a member of the Advisory Board of The Brazil-Florida Business Council, shared his thoughts about what the partnership will bring to the city and the excitement it offers. "We are a community of doers", Homans remarked. "There is a buzz in this community. So many things are happening on so many different fronts." He then introduced keynote speaker Gabrielle Mandel, Country Manager of the Brazil and Southern Cone United States Trade Development Agency (USTDA) who is responsible for business development, project preparation and evaluation, and supervision of USTDA activities. She went on to run down the nuts and bolts of the grant program, and elaborated on how businesses can get support and monetary funds to move projects and studies forward. "Brazil is a dynamic portfolio for U.S. trade", said Mandel. The inaugural luncheon ended with Bonaparte thanking those who attended for their support and interest in the council, and talking about the upcoming initiatives.